London has been at the centre of turbulent events for hundreds of years and as you might expect from a city with such a vivid and dramatic history behind it, there are quite a few ghosts lurking in the nooks and crannies of Britain’s capital. Many of Britain’s most famous institutions have their own resident ghosts. The elegant Pillared Room in 10 Downing Street, which is used for hosting receptions and signing international treaties, is said to be haunted. Several members of staff at the Prime Minister’s residence have reported seeing the ghost of a finely-dressed woman, but no one knows who she might be. The Bank of England is another part of the British establishment which has been known to receive a ghostly visitation or two. The ghost seen most often is that of a woman known as the Black Nun. She was not actually a nun at all though she did dress in a black and white outfit that did give her a nun-like appearance. Her name was Sarah Whitehead and she lived in the early 19th century; her brother, Philip, to whom she was fondly attached, worked as a clerk in the bank. He was convicted of forgery and executed in 1812. Friends and family members, knowing the strength of feeling she had for her brother, kept this secret from her. One day, however, she wandered into the bank and asked where her brother was. A bemused clerk told her the whole story and the shock seems to have unhinged her mind. From that time on, she took to coming into the bank to enquire about her brother. Eventually, the bank’s management gave her a large sum of money to stay away. This worked for as long as she was alive, but, when she died, her ghost returned. London’s royal palaces play home to quite a few ghosts. Buckingham palace is said to be haunted by the spirit of Major John Gwynne, an aide to Edward VII who committed suicide there. A phantom monk has also been known to make appearances here. It is not known who exactly the monk is but, in the early medieval period, a priory once existed on the site of the present-day palace, so the restless spirit can probably be traced back to that. At Hampton Court Palace, former residence of Henry VIII, apparitions of many of his former wives have often been seen - Catherine Howard, Anne Boleyn, and Jane Seymour have all been spotted. Only a few years ago, Hampton Court Palace was also the scene of what some have described as the most remarkable ghost sighting ever – because it was captured on CCTV camera! The incident occurred around Christmas time in 2003. Security guards had been puzzled because doors were being found open in parts of the building where no one was present. Studying the CCTV footage carefully they were astonished to see two doors fly open on their own followed by a mysterious robed figure stepping in to pull them shut again. No adequate explanation for the spooky sighting has yet been offered. Many of the most tumultuous events in London’s history have culminated with someone or other paying a visit (often a final one) to the Tower of London. Some of these poor unfortunates appear to have lingered there to this day. Among them is Henry VIII’s discarded wife, Anne Boleyn. 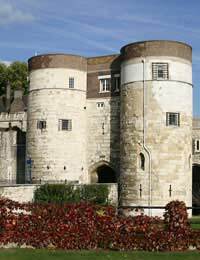 When she was found guilty of witchcraft and adultery, she was sent to the Tower to be beheaded. Her ghost has often been seen here – sometimes with a head and sometimes without. Among the other famous ghostly inhabitants of the Tower are : Guy Fawkes; Sir Walter Raleigh; Lady Jane Grey; Thomas Becket; and the young princes Richard and Edward who were confined in the tower before disappearing - they are believed to have been murdered on the orders of their uncle, the sinister Richard III. There are quite a few companies offering tours of London’s spookier side. Among those to look out for is the one fronted by Richard Jones, Britain’s ghost guru. Jones is well-known for his many television appearances. He is credited with an encyclopaedic knowledge of supernatural Britain and is said to be well able to convey the flavour of a classic ghostly yarn. Lovers of the paranormal have a veritable feast awaiting them with a visit to Britain’s capital city. When night falls, modernity is banished and the past can seem to seep into the present as the ghosts come out to play. I love this article ! Very useful ! Every city with some history has ghost walks. They’re a great way to discover legends and some of the troubled past. Above all, though, good ones make for great family entertainment, especially for kids. They get scared and love it, but they also come away knowing something – what more can a parent really ask? I've been on a few ghost walks in London they're great, I'd recommend them to anyone. Do a quick Google search and you get load of results, just read the reviews first though as some aren't as good as others. I love anything paranormal and found this article really interesting. Has anyone seen the CCTV that it mentions in the article, about the monk walking through the doors that fly open and then shutting them again? London is a great city and there are many haunted places. We've stayed at one hotel in London (can't remember the name now) but it was a sleepless night, there were strange noises coming form the room and the cold tap started running in the middle of the night. Also when we did finally get to sleep we were woken up by the bedside lamps being switched on! I'd also love to go on one of the ghost walks around London too.